January saw the BDS-induced antisemitism crisis within the Women's March reach its peak and a newly elected BDS supporter appointed to the House Foreign Affairs Committee. In both cases, Jewish concerns were pushed aside, fringe Jewish support was manufactured, and Israel accused of fear-mongering and conspiracies to create antisemitism. This pattern replicates that of the British Labour Party. Similar antisemitism and shallow moralizing in Ireland have pushed a BDS bill forward, at the risk of EU and US sanctions. At the same time, the significant drop in Women's March support suggests that Americans will not embrace antisemites as readily as Britons, even in the guise of anti-Zionism and BDS. The focus of BDS activity in January was centered on the Women's March, its leaders, and their relationship with Louis Farrakhan and the Nation of Islam. After an exposé that revealed how a small cadre of BDS supporters had taken over the march, attention quickly focused on their explicit support for the Nation of Islam. In the latter part of 2018 a public relations crisis ensued and March leaders responded by rejecting critics and accusing them, among other things, of "tearing down" black leaders. To deflect criticism the Women's March organizers recruited a small cadre of progressive Jews, as well as fringe rabbis, who explicitly refrained from comment regarding antisemitism. This is similar to the response of the British Labour Party, which after exposure of its antisemitism crises formed its own "Jewish" groups that then proceeded to attack Labour's critics. In response, one of the original organizers of the March stated, "Linda Sarsour is an antisemite and even when she is apologizing to the Jewish community on the one hand, she is condemning it on the other. She can't help it. This is who she is and as long as the five board members are in power you will continue to see these sharp divisions they themselves foster." Tellingly, at the march itself co-organizer Sarsour was cheered when she advocated for"free speech and our constitutional right to boycott, divestment, and sanctions in these United States of America." Similar efforts were reported at other local marches, where Muslim women spoke exclusively about Israel and BDS, in contravention of previously agreed guidelines, while Jewish women were forbidden to even discuss Israel. After the event, the organizers released a policy document that called state-level anti-BDS legislation a threat to "free speech." Sarsour also posted a link to an article claiming that Jews were waging a "profound war on black people." The centrality of BDS to the Women's March and its remaining supporters is consistent with that of its leadership cadre, who appear to have taken over the national organization and several local ones with this goal in mind. This pattern also replicates that seen on campuses, where small cadres have taken over and spread BDS in student governments, Middle East studies, Anthropology, and English departments, as well as academic organizations. The single-minded and relentless fashion in which BDS supporters target organizations is unique and reflects an ideological commitment to Israel-hate that is antisemitic in form and function. But the quiet abandonment of the March by corporate and institutional supporters, and at the grassroots level, suggests that overt antisemitism and BDS have limited appeal. And like the abandonment of the humanities and social sciences, in part a result of pervasive bias, corrosive effects remain, including the spread of BDS into other realms of politics. The election of several BDS supporters to the House of Representatives is thus already changing political discourse regarding Israel. Ilhan Omar's appointment to the Foreign Affairs committee by House Majority Leader Nancy Pelosi puts an avowed BDS supporter and conspiratorial antisemite in a particularly sensitive position, including access to classified materials. Newly elected representative and "one state solution" supporter Rashida Tlaib also expressed her attitude towards proposed legislation prohibiting Federal contractors from boycotting Israel by criticizing Congressional supporters, saying, "They forgot what country they represent. This is the U.S. where boycotting is a right & part of our historical fight for freedom & equality. Maybe a refresher on our U.S. Constitution is in order, then get back to opening up our government instead of taking our rights away." The accusation of "dual loyalties," albeit directed at non-Jewish Senators, capitalized on traditional antisemitic tropes regarding Jews and power. Reports also indicated that Tlaib attended an event with American Hamas and Hezbollah supporter Abbas Hamideh, and that she is a member of a Facebook group that routinely demonizes Jews and Israel. Omar appears to be aware of the poor optics surrounding explicit statements of hatred for Israel. In a recent interview, she defended her 2012 statement calling Israel "evil" and that it had "hypnotized the world," saying that "those unfortunate words were the only words I could think about expressing at that point." But other comments, implying that Senator Lindsey Graham was "compromised," and complaining that the US was supporting a "right wing coup" in Venezuela, demonstrate her culturally conditioned mindset in which conspiracies are explanations. In another sign that BDS has become a political football, Republican inclusion of previously proposed anti-BDS provisions in the Strengthening America's Security in the Middle East Act attracted ire from leading Democrats and independents such as Bernie Sanders regarding alleged free speech restrictions. The ACLU, J Street, and pro-BDS groups also expressed vehement opposition to the bill and its predecessors. The bill passed the Senate on the fourth attempt with limited Democratic support and almost none from the growing slate of potential presidential candidates. The bill now moves to the House of Representatives. 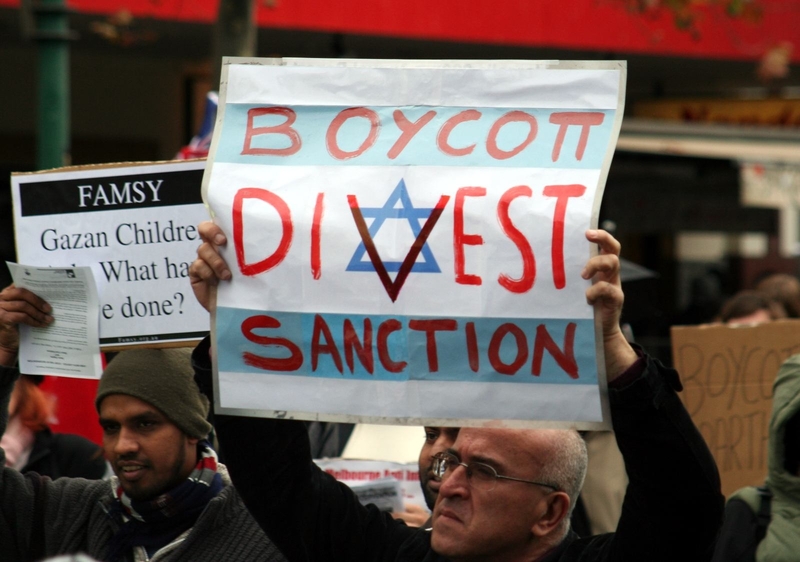 The misrepresentations regarding free speech expressed in opposition to the Federal BDS bill were partially addressed by a Federal judge who ruled that the Arkansas anti-BDS law was constitutional. Another bill was introduced in the House of Representatives condemning antisemitism, BDS, and referencing Farrakhan by name. The bill is seen as a test of the Democratic leadership's willingness to defy its "BDS caucus." The relentless racialization of BDS and antisemitism as anti-Zionism also continued in January. One example was the exploitation of Martin Luther King Day, when a column in The New York Times used the occasion to deliberately misrepresent his attitudes on Israel. Another was the angry backlash when the Birmingham Civil Rights Institute in Alabama withdrew an award from Communist and black power academic Angela Davis after protests regarding her support for BDS. Several of the institute's board members resigned and the Birmingham City Council passed a resolution in her honor. The institute later reversed its decision and apologized for its "mistakes." In the international sphere, the Irish parliament passed a bill criminalizing economic contacts with Israeli entities in the "territories." The vote, which now moves toward the next stages, was done over the objections of the Irish government, which warned that the law contravenes both European Union and US regulations. The government and legal observers also warned that, if passed, the law would lead to international corporations reassessing their businesses in Ireland. The law would impose penalties including fines and imprisonment for importing or selling products from Israeli communities across the Green Line. In theory, buying souvenirs or doing business with entities with employees residing in the region would be liable. Irish and other observers note that the bill is exclusively aimed at Israel as opposed to other "occupying powers." The parliamentary debate was marked by dramatic expressions of hostility towards Israel. In response, an Israeli parliamentary delegation cancelled a trip to Ireland and Israeli officials were considering tariffs on imports from Ireland. The irrational focus on Israel was also seen in a recent call by the British Labour Party's Shadow Foreign Secretary to boycott arms exports to Israel over attacks on Hezbollah and Iranian weapons shipments in Syria. In campus news, the fallout continues over the decision of the Pfitzer College faculty to call for the end of student exchange with Haifa University. Faculty members defended the action and criticized the school's president who had condemned the vote. Similar reactions came from University of California faculty who condemned the system's Chancellors for their statement opposing Israel boycotts. The backlash from administrations is a sign that while BDS is tolerated in student governments, university administration are becoming alarmed by faculty efforts that explicitly discriminate on the basis of national, religious, and ethnic origin. Though cast in principled terms of free speech and academic ideals, administrations likely fear the political and legal ramifications of employees adopting discriminatory policies. BDS efforts to capture and dominate campus discourse also continued in the new semester. A petition from 70 student groups in the Student Coalition for Campus Labor Justice demanded that contract negotiations for student and non-student employees of the University of California system "(1) Provide livable wages and stable benefits and retirements to all UC workers; (2) End subcontracting practices; (3) Terminate all direct and secondary ties with federal immigration agencies unless legally required; (4) Divest from companies complicit in the violation of Palestinian human rights; (5) Prohibit the deployment of UCPD to on-campus actions; (6) Guarantee academic freedom to academic librarians; and (7) Satisfy the bargaining demands of all UC labor unions." At the University of Michigan a faculty panel discussing responsibilities towards students, convened in the aftermath of incidents where BDS-supporting faculty denied students letters of recommendation for study in Israel, was physically taken over by BDS supporters. Faculty members permitted students to control the session without any interventions. In a now typical effort to control discourse over antisemitism, the University of California at Irvine chapter of Students for Justice in Palestine demanded replacing a workshop offered by the ADL with one by Jewish Voice for Peace. It is unclear whether the university administration will fall for this transparent ruse. Finally, regarding efforts to take over institutions, reports clarified that Birthright participants who disrupted a recent trip were in fact If Not Now members who were manufacturing a provocation. The student government at Georgia State University rejected a BDS resolution, in part over concerns that it would contravene the state's anti-BDS legislation. The vote came after earlier sessions that featured angry protests regarding trips to Israel by student government members. Elsewhere, the Principal of King's College London, the site of numerous BDS related disruptions of Israeli speakers and events, stated that he "abhorred" Israel Apartheid Week and detailed efforts to mitigate anti-Israel bias on campus. His statement to a Jewish group came as reports indicated the number of extremist (Islamist) events, including "hate preachers," on British campuses had increased to over 200 in the last academic year, putting Jewish and pro-Israel students at risk. It also came as the student government at University College London voted overwhelmingly not to adopt the International Holocaust Remembrance Alliance's definition of antisemitism, which includes criteria about Israel. Alexander Joffe is a Ginsburg-Ingerman Fellow at the Middle East Forum.